These are examples of three of Matrix's Style Link products. Their styling products are linked together to show that they all work together in conjunction with each other to make your hair look amazing. There are eight products in the collection. Get a grip on your hair. 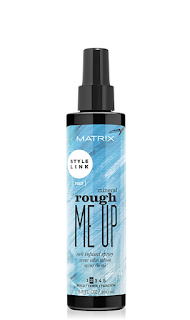 Your link to roughed up looks with a lightweight texture is here. This cream is enhanced with a micro mineral that gives it a non-sticky shape and hold. It leaves hair looking perfectly undone. Apply through damp hair, working it through to get the perfect grip. This can be purchased through Ulta and JCPenney Salons. Boost your texture now. This is your link to clean-feel texture. It is lightweight separation and major grit. Now powered by next generation minerals. Customizable texture. Layer for definition or use alone for buildable texture. Apply Mineral Booster by itself to transition from smooth to textured hair easily. Blend or layer with any Style Link product. Available only at JCPenney Salons. Get a grip on your hair. This is your link to roughed up looks with lightweight grip. Texture cream, enhanced with a micro mineral, that gives a non-sticky shape and hold. Leaves the hair looking perfectly undone and beautifully roughed up. Beachy touchable waves without the crunch or the beach! If you want beach hair, this is how you can get it without having to use the beach or to stay out in the sun and sand all day. For me that is absolutely perfect since I cannot stay in the sun. To use, apply evenly through damp or dry hair, working it through for a perfect grip. This is available at Ulta and JCPenney Salons. Matrix makes a lot of styling products. I was able to try these three. Which is great because these are the kinds of styling products I like to try, I like my hair to be tumbled around and free flowing. It is long and doesn't have many layers in it right now. So I use styling products as a way to counteract frizziness and make my hair feel fun and fancy free. Texturizing is a great way to do this. Using texture on your hair adds fun to it and also adds some weight to the hair. Without any grease or oil. These Matrix products are available at Ulta Beauty or JCPenney Salons across the country. Matrix Facebook is https://www.facebook.com/matrix; Matrix Twitter is : https://twitter.com/matrixfamily/; Matrix Pinterest:https://www.pinterest.com/matrixfamily/; Matrix Instagram: https://www.instagram.com/matrixusa/ and Subscribe to Snapchat about Matrix: https://www.snapchat.com/add/matriximagine.